Experience the ultimate luxury adventure of Peru on a 16 day custom expedition showcasing the country's highlights! Your journey begins in the capital of Lima to experience the metropolitan feel of the coast before heading to Arequipa and the famous Colca Canyon. Witness the spectacular beauty of one of the largest canyons of the world, witness condors flying overhead and amazing views as you make your way to Lake Titicaca. 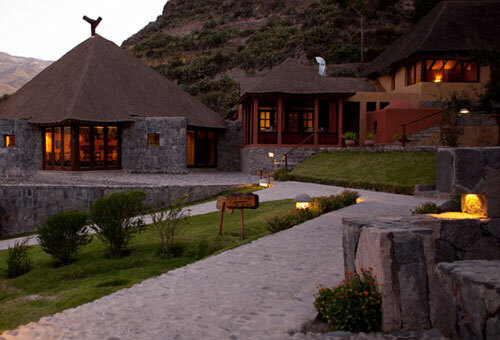 Immerse in the depth of Inca Culture on the shores of Lake Titicaca and enjoy one of Peru's unique boutique hotel. From there, continue on the Andean Explorer train to Cusco. The colonial city of Cusco, is an ideal basecamp to discover the history, admire the architecture and visit the Sacred Valley, tucked in between the striking Andes Mountains. From there, you will take the train winding along the Urubamba River until you've reached the ancient citadel of Machu Picchu. Discover the seemingly endless twists and turns of the ruins and admire the captivating scenery, as the centerpiece of your journey. Lastly, the Amazon Rainforest awaits, for the final stop of your trip. Observe the exotic wildlife, walk among the treetops and glide through the waters by canoe on this jungle escape. Today, you will enjoy one of the most exciting and hands on ways to get to know the city of Lima! Savor the food, chat with real limeños and visiting the top restaurants, districts and historical points, that the locals prefer, for a more dynamic and unique experience. This tour has been designed as an ideal introduction to the city and Peruvian culture, so that you can get a real feel for it in only 5 hours. Your adventure begins at a local roastery, where they hand-pick the coffee beans daily, for an organic Peruvian coffee treat. You will also tour the colonial streets of the bohemian district, Barranco, home to artists, musicians and the city’s top art galleries. From here, you will visit a traditional market in the San Isidro district to try exotic fruits, local products and learn the ancient myths and legends associated with them. The third stop is one of the city’s top seafood restaurants (cebichería), Embarcadero 41 Fusión, on Avenida La Mar in the Miraflores district – a stop that most travelers to Lima won't know to come by. Arequipa is Peru's second largest city, with a population of about 620,000. Characterized by beautiful Baroque churches and charming colonial buildings, this holy city features a sea of white. From the vistas of sandy rolling hills in the distance, to the bright shimmering structures in the city center, the shades of white are enchanting. The snow capped volcano of El Misti soars above the central Plaza de Armas, which is bordered by the twin spires of the Cathedral and two levels of double arcades. Extending from the central plaza, are streets laid out in a grid like pattern, making the city idyllic to explore on foot. Today, you will be whisked away on a three day adventure through the scenic Colca Canyon! Your journey begins with a drive along the Yura's highway, with the chance to admire the snow-capped mountain Chachani towards Pampa Cañahuas, the Reserve of White Wash and Salt Mines. During this picturesque ride, keep your eyes out for the local wildlife, including the vicuñas, alpacas, llamas and numerous migratory birds soaring through the sky. You will continue on this same road, making stops en route to visit the towns of Chuccura and Patapampa. Upon arrival in the town of Chivay, you can enjoy some free time to relax and have lunch, before checking into your hotel. Unpack your things, get settled and enjoy the rest of the evening as you wish. A delicious dinner will be served later tonight, followed by a lovely night's rest. Wake up this morning in awe of the incredible views of the surrounding landscapes. You will depart from your hotel and head to the Cross of the Condor Viewing Point, where today's excursion begins. Here, you will have the opportunity to observe one of the deepest canyons in the world, as well as the impressive flight of the Condors. Watching these majestic birds soar above the deep mountain crevasses is truly a sight you will never forget. Following this exhilarating experience, you will return to Chivay in time to enjoy a traditional lunch. 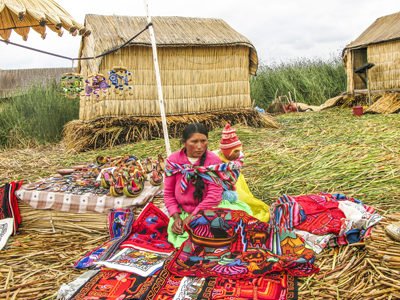 Later this afternoon, you will visit Cabanaconde, where the local people produce corn. You will learn all about their production processes and techniques, before continuing your exploration to the rural villages of Macca and Yanque. You will also have a chance to visit the beautiful churches of the Colony’s time. Stop at the Mirador from Antahuilque, for one final exploration, before transferring back to your hotel for dinner and relaxation. Make the most of your final day in the stunning Colca Canyon region, with visits to the fascinating villages of Coporaque, Chinina, Ichupamp and Uyu Uyu. Heading this far off the beaten path will be a truly special Peruvian experience, not had by many travelers. The friendly locals offer their hospitality and generosity, as they welcome you into their home and share their day to day life. As the afternoon arrives, it will unfortunately be time to say goodbye to this beautiful area and continue your adventure onward. Continue your adventure to Lake Titicaca. 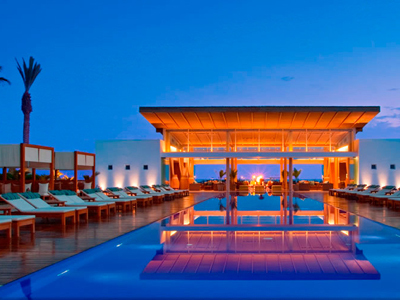 Upon arrival, you will check into the Titilaka Boutique Hotel. This will make for a seamless and exciting start to your Lake Titicaca adventure! Your scenic drive will take you through Juliaca and the port city of Puno. When you have reached the Lodge, check into your room, make yourself at home and admire the surrounding views, as you adjust to this beautiful destination. Wake up this morning at your leisure and indulge in breakfast in bed as you enjoy a magnificent sunrise, if you wish. Once you are up and ready to go this morning, your guides will take you by car and boat to visit the legendary islands of Uros and meet one of traditional local families that live there. This fascinating cultural experience is sure to be a highlight of your trip. 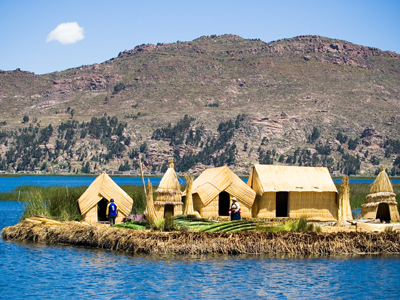 The Uros Floating Islands are located near the protected National Reserve of Titicaca. The people of Uros are a proud culture who, due to persecution by other groups, found refuge by living on manmade islands many years ago. They call themselves kot-suña or, "people of the lake", who claim to have "black blood", as they are immune to the cold and consider themselves to be owners of the lake and its waters. During this excursion, you will learn all about their history, uses for totora reeds and custom traditions. You will also have plenty of time to explore one of these impressive islands. This fascinating region is a must for travelers to the area, so you can expect to see many other visitors in the region. After breakfast this morning, it will sadly be time to check out of the lodge and transfer to the train station. Depending on the train schedule you may like to enjoy one last adventure en route to town, with a guided excursion to Sillustani. This is a spectacular peninsula facing the Umayo lagoon and home to the area’s best preserved remains. In addition to its unique geography, this site was a burial ground for the Pucara, Tiahuanaco and Ccolla pre-Inca cultures, long before the Inca expansion. 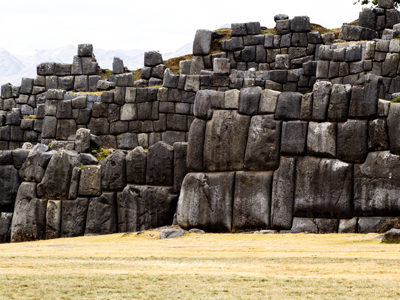 The tower-like structures known as Chullpas, which symbolized life and birth, are ancient and impressive tombs for chiefs and other dignitaries. This is an impressive site that combines archaeology, history and an amazing landscape. On arrival at the train station, you will board the luxury all-day train from Puno across the high plains to Cusco. This is one of the “Great Train journeys of the World”. The waiter service and entertainment is everything you would expect of the ‘Orient Express’ service. On arrival in Cusco, a private vehicle will pick you up from the train station and transfer you to your hotel for your stay. This morning, you will be picked up from your hotel in Cusco and taken on a full day private discovery of the famous Pisac Market and Ollantaytambo Fortress. 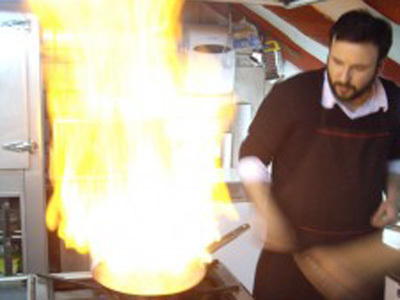 This tour includes lunch at a desirable local restaurant, that serves some of the most delicious traditional dishes. Enjoy an early morning visit to the fabled ruins, spending today in both guided and individual exploration. Take your time to investigate the multitude of hidden nooks and corners, as you discover the most fascinating features of this astounding and mysterious Inca settlement. Just when you think you've seen it all, turn the corner and let another perspective of the ancient ruins and pristine landscape captivate you. Machu Picchu is calling! Return to this enchanting attraction this morning, to continue exploring on your own. Delve deeper into features of the ruins that you have not yet discovered. Unlike your touring experience from yesterday, today's adventure also includes a permit to hike to the summit of Huayna Picchu! Although this grueling trek is up a series of sheer and challenging steps, the view from the top promises to make every bit of hard work beyond worth it! At the end of this unforgettable experience, you will ride the shuttle bus back down to Machu Picchu Pueblo, where you will board the Vistadome Train. Upon arrival at the train station, you will be welcomed by a driver and transferred to your hotel. Upon arrival at the Puerto Maldonado Airport, you will be met by an Inkaterra representative and transferred to the boarding wharf. Begin to experience the enchantment of the rainforest, as you take a 45-minute boat ride along the Madre de Dios River to arrive at Inkaterra Reserva Amazonica lodge. After a short briefing, settle into your beautiful cabaña and enjoy your lunch in the dining room. Take a siesta if you wish, followed by a refreshing tea to get ready for the afternoon excursion. Take a look at your Inkaterra Explorer Guide, to choose from the various excursions available at the lodge. On your first day, we recommend a guided walk along the Trail system, into the Inkaterra Reserva Amazonica natural area, where you will discover the Amazon Basin. This trail offers an excellent introduction to the jungle environment, winding past impressive trees such as the Shihuahuaco, and the strangely beautiful strangler fig, offering excellent opportunities for bird watching and observing exotic insects. Rise early or sleep in late this morning — the choice is yours. A full buffet breakfast begins at 5:30 AM, for those who want to avoid the heat and enjoy nature at its fullest, but continues until 9:30 AM, for those wanting to sleep in. Following breakfast, you may wish to embark on the Lake Sandoval excursion into the Tambopata National Reserve. Glide in a wooden canoe, across a beautiful, mirror-like oxbow lake that is home to the endangered giant river otter, as well as red howler monkeys, red-bellied macaws, anacondas, side-neck turtles and black caimans. At lunch time, you will head back to the lodge for some relaxation and reminiscing on your morning adventure. Hotel B is a luxury boutique property located in the bohemian seaside neighborhood of Barranco. The property serves as a comfortable and intimate home base for exploring the wonders of Lima. The historic building was originally constructed in 1914, as a seaside retreat for Lima's elite and was recently restored to its former glory, following an extensive two year renovation. An eclectic blend of museum-quality artwork is highlighted throughout the hotel, celebrating Peruvian and international artists. Famed chef Oscar Velarde designed the restaurant's menu, featuring fresh Peruvian ingredients, complimented by Mediterranean flavors. Located in the lovely area of Historical Center, Libertador Arequipa Hotel enjoys a commanding position in the sightseeing and culture hub of Arequipa. From here, you can enjoy easy access to all that the lively city has to offer. You can take pleasure in touring the city's top attractions, such as, Iglesia de San Francisco, Cusipata and ROCIO. The property offers many facilities on site to enrich your stay. For your comfort and convenience, you can make use of free Wi-Fi in all rooms, 24-hour front desk, facilities for disabled guests, car park and room service. The hotel's hot tub, fitness center, sauna, outdoor pool, massage are all ideal places to relax and unwind after a busy day. Whatever your reason for visiting Arequipa, the Libertador Arequipa Hotel is the perfect venue for an exhilarating and exciting break away. The Eco-spa at Colca Lodge is blessed with hot springs whose water is rich in lithium, an element that promotes relaxation. The spa at Colca Lodge exploits geothermal energy not only for use in the various rituals and services offered to visitors, but also as a way of avoiding environmental pollution. All of the spa's treatments start at the hot springs, be they massages, applications, or facial-care routines. This detail, together with an impressive view of the Colca Valley as an incomparable natural backdrop, enables guests to enjoy an unequalled natural relaxation experience which is continued in the hands of the hotel's capable staff. Titilaka was created to provide an alternative for travelers seeking an authentic, intimate and comfortable encounter with the cultural nuances and natural splendor of Lake Titicaca. Located just an hour east of Puno, on a remote portion of the lake shore, Titilaka houses only 18 suites, categorized as 'sunrise' or 'sunset.' Each suite is replete with radiant floor heating, extra large soaking tubs and sumptuous daybeds beneath panoramic windows overlooking the lake. Even better than the contemporary luxury of the property though, is the unique opportunity to interact with the local indigenous populations. These authentic experiences are what truly set Titilaka apart. 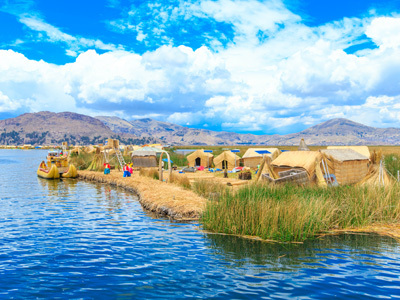 A visit to the floating islands of Uros and to the charming Island of Taquile are offered, but the magic really begins with exploring the neighboring communities and landscape around the hotel, which, due to the property's location, are virtually exclusive experiences for guests of the hotel. Inkaterra La Casona was the first boutique hotel in Cusco, and still remains the best. Located in a carefully restored 16th-century Spanish Colonial mansion, the opulent period interiors are discretely closed to the curious public behind a heavy, intricately carved wooden door facing the flower-filled Plaza Nazarenas. This quiet area of Cusco, which today is a highly coveted locale among discerning guests, was formerly reserved for the homes of Inca elite, the warrior class and institutes of higher learning. With just 11 suites that surround a central garden, La Casona provides an intimate residential feel, capturing the sense of privacy and privilege experienced by those who once lived here. Surrounded by spectacular Andean vistas and located halfway between Cusco and Machu Picchu, Inkaterra Hacienda Urubamba is the perfect base to explore the heart of the Incan Empire, the Urubamba Valley. Often referred to as the Sacred Valley, this lush strip of fertile farmland is replete with beautiful ancient terraces. The rich cultural treasures of this land are often condensed into a day trip from Cusco in the rush to get to Machu Picchu, but travelers in the know will appreciate a few days in the Urubamba Valley where authentic immersion in the Andean heritage is possible. With only 36 rooms on property, your experience here will be personalized, intimate and unforgettable. Inkaterra Reserva Amazonica is an award-winning eco-lodge situated along the steep banks of Peru's meandering Madre de Dios River, at the heart of a 29,650-acre private ecological reserve. Your exotic Amazon immersion begins almost immediately. You will travel to the lodge in comfortable outboard dugout canoes, leaving civilization behind on a 45 minute scenic river journey. Tree-trunk boardwalks wind through the property, designed in the fashion of a native Ese’ Eja village. Private thatched-roof cabanas, built on raised platforms in the indigenous style, surround a stunning open-air main building and dining room, that blend almost seamlessly into the jungle. Luxurious furnishings, amenities and delectable food offer an elegant complement to the simplicity of the jungle. Accompanied by expert local guides, you can explore the surrounding Amazon Rainforest on jungle hikes, canoe trips and along the Canopy Walkway, a series of 7 hanging bridges suspended nearly 100 feet off the ground.